One of the ongoing themes we’ve been looking at thus far with The Ravens specifically, but also rock ‘n’ roll in general over these first fourteen months, has been the line of demarcation between rock music, a rowdier style with a different outlook and mindset intended for a specific audience who were generally (and forcibly) kept out of the mainstream loop, and that of pop music as well as jazz which both embodied a more proper refined style for an audience that was squarely in the mainstream, or in the case of the latter at least in the aspiring black mainstream of America. On the surface these two divergent camps would seem in no danger of ever getting too close to one another, but the reality was that the more established ones, the pop and jazz kingdoms, were where the commercial clout still lay and so the promise of breaking through to those factions was often a siren call too powerful to resist for many rockers. It’d be almost a decade before the tide fully turned and the pop acts began to make concessions to the growing commercial power of rock in the mid-50’s, moving their styles closer to the rock field in an attempt at staying relevant as the music world changed under their feet. But at this stage the reverse was true, if either side was going to make concessions to try and spread their appeal and bring in more sales and the resulting expanded opportunities for live gigs it was going to be the rock artists inching back towards the accepted pop sensibilities. Vocal groups were the most likely (or most vulnerable, or corruptible, fill in the blank as you see fit) for this type of stylistic compromise. The fact that there were more precedents in the pre-rock world for success by black vocal groups in a pop realm (The Ink Spots most notably) made labels think that it was possible for them to crack that market as well, while the artists themselves were the ones who grew up listening to their milder forbearers temper their approach and so it probably seemed quite natural to do, not quite the “selling out” it’d be viewed as down the road. Furthermore the types of songs vocal groups needed could be easily found by mining standards and thus they would have an already established blueprint in a more sedate manner to follow. As a result The Ravens, like their closest rivals The Orioles, often found themselves straddling the line between the two fields, usually to their detriment. In the end it’d be their rock forays that not only built their fame but ensured their lasting legacy, yet that didn’t stop them from constantly flirting with pop directions because history at that point was indicating the reverse was true and that only by appealing to the pop mainstream could they ever be taken seriously. We’ve seen this take hold with The Ravens already. Their best work to date was firmly in the rock milieu, Write Me A Letter which established the vocal group approach for rock, and its equally popular sequel Send For Me If You Need Me confirmed that this was the way to go, setting the precedents that rock vocal acts would follow for generations. But that didn’t stop them from moving towards the blander pop field with such records as September Song or How Could I Know, the latter beautifully sung by Maithe Marshall yet completely unsuited for establishing rock ‘n’ roll as something demonstrably different from polite pop. Luckily it tended to be their rock sides that sold best and one would think that this would lead to them abandoning, or at least largely curtailing, their more sophisticated aspirations, yet we know that’s not true, not now and not in the future, and so with each new release by The Ravens we hold our breath and simply hope for the best. When you picked up the record as it hit the shops this month you’d be pardoned if you immediately put it back on the shelf and walked out in a fit of anger upon seeing the writing credit for the top side – Always. Irving Berlin may in fact be the best songwriter of the 20th Century, yet he was the antithesis of a rock ‘n’ roller. 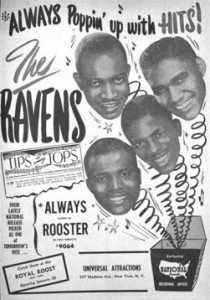 If The Ravens expected you to keep handing over your hard earned money to hear them recite the Great American Songbook – most likely done in a style designed to appeal to Americans with a far lighter skin pigmentation than yours to boot as was usually the case when aiming for pop acceptance – then you’ll have no choice but to pass. And yet it was Irving Berlin who also wrote White Christmas which The Ravens had just recently deconstructed in a way that made you legitimately proud of their audacity in exhibiting such black pride and this being December that record was still being heard every time you turned around as it was sitting in the Top Ten on the Race Charts at this very moment. Now you’re a bit more conflicted as you stand in that store, your money in one hand, the record in the other. Plus if you DON’T get this it could be a couple of months before you get the chance to hear a new record from The Ravens and even then there was no guarantee it would be rock either. Just how far were you willing to take your business elsewhere in an attempt to keep your standards high (or keep them low as it were)? What the hell, you say, it’s only money, you’ll fork over the change and if this one’s not any good there’s still time to give it to some unsuspecting girl as a Christmas present and maybe win some points for your thoughtfulness that might do you some good if you find yourselves wandering quite accidentally under the mistletoe you previously hung for just such an occasion. As soon as you put the record on though the mild harmony intro might have you turning right around and taking it back to the store and demanding a refund. But you’ve learned by this point to at least wait until Jimmy Ricks makes his presence known before making a final verdict. Thankfully, he doesn’t disappoint… though he doesn’t exactly alleviate ALL of your concerns either. It’s somewhere in the middle and thus your reaction largely depends on your state of mind at the time, along with what other music is floating through your ears leading up to this. I don’t know how many times I can use the word context here on the blog, I’m not keeping count in any event, but it’s always the most important thing to keep in mind when looking back so many decades on the music from another era. Usually with what we do here context refers to what else was happening at the time in regards to the standards of the day and how these records either broke from that or fit into it. But in the case of Always the context I’m referring to has more to do with the context of other records you pair this with when you listen, because that can make all the difference in your potential appreciation of its virtues. When first hearing this in a totally isolated fashion while going over the release schedule for the month of December 1948 to determine which records to review my reaction was admittedly negative. In fact I quickly tossed it in the discard bin, annoyed that yet another Ravens release was hampered by dreams of (and I cringe writing this with its negative social implications) “upward mobility”. This idea someone at the time must’ve had that implied the rock audience was a lower breed of consumer than the higher class white adult who they seemed to be targeting with material such as this. Frankly if that’s what you think, well… in the words of Edgar Allen Poe: Take thy beak from out my heart and take thy form from off my door! – Quoth the Raven, “Nevermore”. But when going over the choices again later on (much later) and looking for a way to frame the review for the flip side of this record, I listened again to Always to see why I’d excluded it. Just prior to doing so I’d been reading the reviews of prior releases by The Ravens that I had included and listening to the records themselves once again the exclusion of this one seemed less justified. Certainly when compared to the likes of Together or Once In Awhile this one didn’t sound quite like an egregious affront to my self-respect as it had before. In fact when assessing the make-up of those songs this certainly isn’t any MORE ill-suited to being covered here and in some ways it actually fits better. So I reversed my earlier decision and here it sits for your evaluation as well as mine. 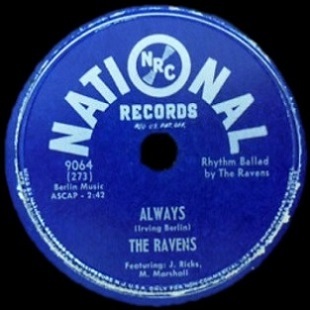 The Ravens can usually be counted on to sing with great skill, control and precision, and with Jimmy Ricks at the forefront they’ll always be injecting a good deal of earthiness and soul into even the blandest of material. But how they choose to frame this, the style of their delivery in other words, is often determined by their goals in who they want to reach. We can tell by the way they over-enunciate each word and try and impart an “airier” backing in their wordless harmonies that they are looking past us and trying to reach those not from our musical zip-code. When that happens the songs have a tendency to become emotionless trifles and – if we bother reviewing them at all – will generally be massacred with justification. But here they don’t quite do that, at least not to the extent we’ve come to dread. Actually this is somewhat surprising since they cut Always way back in September 1947, a time when rock itself was just leaving the womb, and so there was no established market for that brand of music to take into consideration. On original material cut at the same time, like Write Me A Letter, you can understand how their own natural instincts shaped it and thus set it up perfectly to be embraced by the fledging rock community when it was released the following month. But on something like this you’d imagine they would thinking of it in more of a strictly pop vein. Ricks, to his credit, doesn’t let that happen, as his appearance doesn’t hold anything back, his voice free to deeply plow the earth laid out before him rather than tread lightly over its surface. That makes all the difference here as following his lead the others ramp up their deliveries to match him. Their harmonies are exquisite, while their brief interjections aren’t lacking in emphasis as would often be the case when they pulled back too much. Maithe Marshall, who due to his high tenor/falsetto and the role he’s often cast in as the main counterpoint to Ricks, has a tendency to be the lightning rod for scorn here at times, not because he doesn’t have a great voice but simply because he’s being called on to deliver the bridges designed for pop appeal that most songs of theirs contain, thereby shifting the setting of the record into a realm which never works to their ultimate advantage. That’s the case here as well. His part is far too flowery as he needlessly embellishes the melody giving it a theatrical bent that only emphasizes the artificial nature of it, especially when compared to the more grounded approach the others take. Yet when he adds his voice to the full group refrain that follows it’s absolutely gorgeous, closed out with appropriate gravity by Ricks whose presence pulls it all back together. That’s what we wait for, because that’s what they as a group did better than anybody and sometimes it’s worth slogging through the delusions of pop grandeur to hear just a few precious seconds of this form of authentic shimmering artistry. When Marshall takes another solo, though comprised of a similarly unsuited and exaggerated tone, it works better because the others are in closer proximity. They lead into it collectively, the group as a whole with Marshall on top and Ricks holding down the bottom, followed by Ricks alone to set up the sudden flight of Marshall’s high voice which now has something to play off and as a result it works all the better for it. They close it out together, Marshall most prominent but with a great “Bay-bee” tossed in by Ricks to drag it further away from polite supper club stylings, and in the end you wind up liking it all the more because of the variety. Granted it’s still not anything close to the cutting edge of the rock vocal idiom they spearheaded over the past year but unlike their more blatant stabs at pop acceptance this song shows that even if pushed in the direction of the middle of the road they still felt more comfortable veering off towards the gutter. In the end they won me over. Barely maybe, but just enough to make it worthwhile. Although I typically like the Ravens’ pop numbers more than you (especially “Until the Real Thing”), liked this one decidedly less. I don’t hate it though. Its just that it’s one of those Ravens records that I can zone out on. I’d give a four. Just so nobody thinks I’m being unduly harsh on the pop-styled numbers out of sheer stylistic preference, always keep in mind that I’m grading all of these strictly in a rock context and therefore a poppish song is going to fall short for the standards used in a rock setting. Now if this website were focused on charting the history of traditional pop then the same songs that might get below average scores here (“Until The Real Thing Comes Along” among them) would get above average grades there, while The Ravens rock sides would be the ones getting 3’s and 4’s because they don’t conform stylistically to the dominant pop aesthetics. Same songs, same (hopefully impartial) judge, but just a different context to consider. Leave a reply on "The Ravens: “Always”"